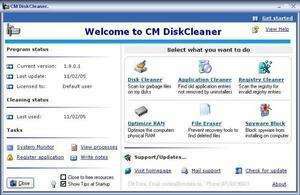 CM DiskCleaner is an award-winning disk cleaning and optimizing tool for your PC. Get all the tools you need to find and remove garbage files, temporary internet files, history, cookies, index dat files, Windows registry entries and much more. currently includes one of the best registry cleaners available. Built for both technical and non-technical users. Version 2.1.7 is a freeware program which does not have restrictions and it's free so it doesn't cost anything. For security reasons, you should also check out the CM DiskCleaner download at LO4D.com which includes virus and malware tests. Additional screenshots of this application download may be available, too. CM DiskCleaner has a presence on social networks.